The Hawker Hurricane is a 1930's British designed aircraft manufactured in the UK by the Hawker Aircraft Company and in Canada by the Canada Car & Foundry Company. 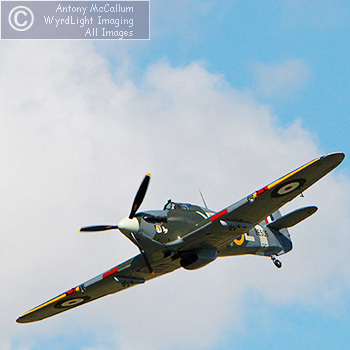 Used in many war theatres it served most famously as the unsung hero in the Battle of Britain. It's designer Sir Sydney Camm was born and lived in Windsor a few miles from the Air Forces Memorial at Runnymede. Many of those whose names are shown at the Memorial fought and died in Hurricanes. Originally built in 1942 at the Canadian Car & Foundry Company for the Royal Canadian Air Force. First post-restoration flight 27th January 2009. These WyrdLight photographs taken July 2009. As BE505 she is fitted with underwing pylons to carry 250lb bombs, 4 cannon and 6 machine guns. 14,231 Hurricanes were manufactured between 1937 and 1944 and operated in theatres of war across Britain, Europe, Africa the far East and Russia as the most common British aircraft in the Soviet Air Force. Eventually over 25 nations operated Hurricanes within their forces. Sir Sydney Camm was the eldest child of Frederick Camm and Mary Smith. He attended the then Royal Free School at Batchelors Acre in Windsor and lived near Windsor Central railway station. Camm was an extraordinary aeronautical engineer whose interest in aircraft began early spurred by his membership in the Windsor Model Aeroplane Club. His accomplishments as a model aeroplane builder culminated in a man-carrying glider which he and others at the club built in 1912. Camm joined the Hawker Aircraft Company (later Hawker Siddeley) at Kingston upon Thames as a senior draughtsman in 1923, becoming Chief Designer in 1925. He participated in the design of many Hawker aircraft, including the Hawker Tomtit, Cygnet, Hornbill, Nimrod, Hart and Fury. 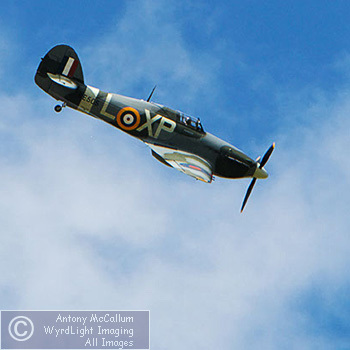 Camm then designed aeroplanes that helped take the RAF to victory in the Second World War including the Hawker Hurricane, Hawker Typhoon and Hawker Tempest. Camm was knighted in 1953 for his contribution to British Aviation. All images on these pages are derived from 17 or 21Mp WyrdLight © originals.